I suspect that in both Canada and the US Thanksgiving worship happens in a variety of settings. Some will read these texts at community services. Others might use them on the Sunday before Thanksgiving (ditching the Christ the King/Reign of Christ texts). And, who knows how others will use them. Leave a Comment and tell the rest of us how you will use them. 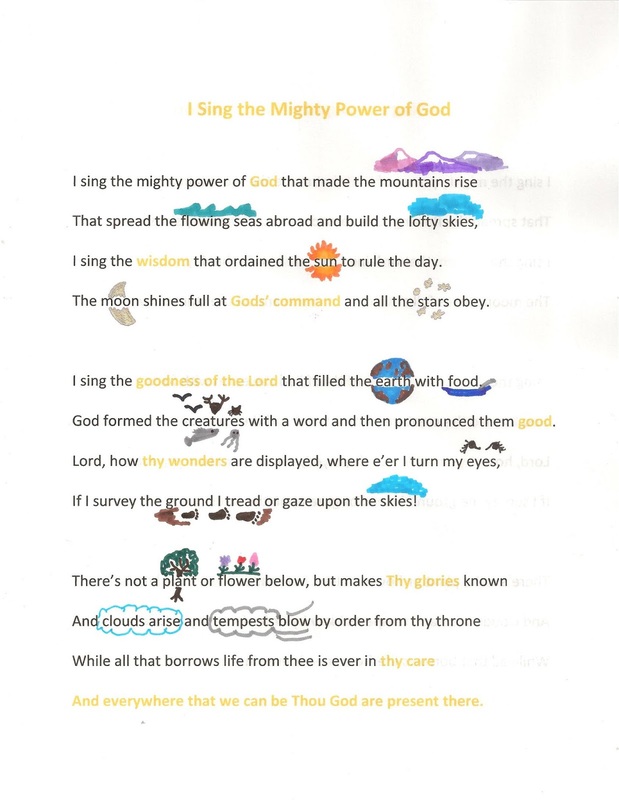 ~ Have the children in classes in participating congregations illustrate hymns that will be sung. Scan their drawings and project them during the singing. ~ Include children’s choirs in the singing. Either gather children in all the churches into one choir or invite several children’s choirs to sing at different points in the service. The former requires at least one rehearsal which can be a minus (another meeting) and a plus (chance for children to sing with friends in other congregations and to be in at least one of their buildings). The latter requires no extra gatherings, but can turn into a choir competition – not terribly conducive to giving thanks. What have you seen well done? ~ Before singing the Doxology, invite all the children to meet you at the front. Note that you are about to sing a song that begins, “Praise God from whom all blessings flow.” Define “blessings” as those things that are so good they make us happy to be alive. Name one or two of your blessings, then ask the children to name a few of theirs. (And, yes video games are blessings to certain people. So, don’t let the congregation laugh at them!) Then send the children back to their seats to join the congregation in singing the song praising God for all their blessings. This word sheet may be used for non-commercial purposes. ~ The old standard Thanksgiving hymns (“Come, Ye Thankful People Come” and “We Gather Together to Ask The Lord’s Blessing”) are not easy for children. They are filled with unfamiliar vocabulary and metaphorical harvest images. Older adults learned them at school when they were growing up. Children today do not. ~ “We Plow the Seeds and Scatter” is a better harvest hymn. 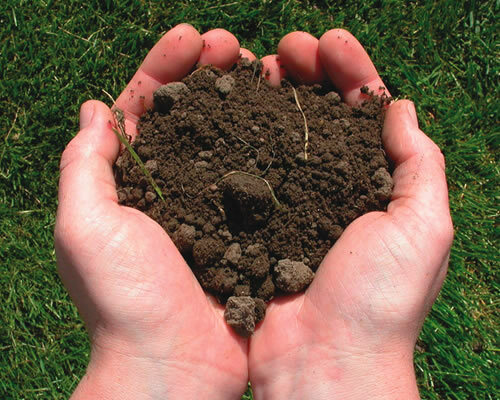 It sets concrete harvest images to a simple tune. 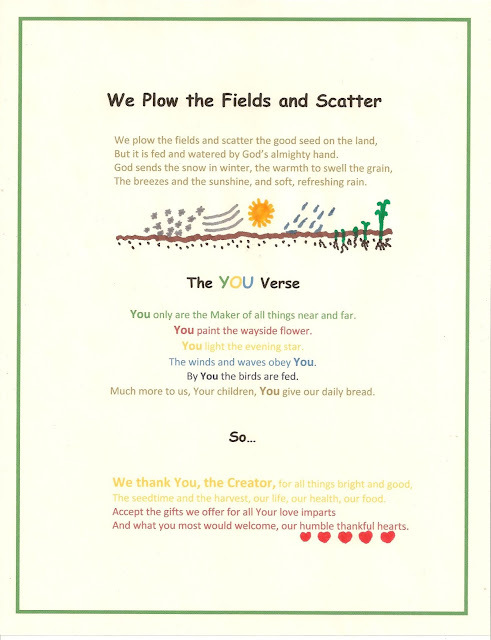 Help children further by offering them illustrated word sheets and walking through the structure of the three verses before singing them. 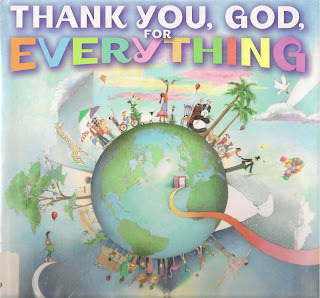 ~ “Now Thank We All Our God” is a more general thanksgiving hymn children can sing at least parts of. ~ “Grateful,” a song by John Bucchino, is illustrated in a book of the same name that comes with a CD of Art Garfunkel singing the song. One way to use it in worship is to scan and project the pages, teach the congregation the chorus, then listen to Garfunkel sing joining him on the chorus as the book is projected. The third verse is the most child accessible. I would start there to introduce the song and define “grateful.” Many of the ideas in the other verses are beyond the experience of children. ~ What songs would you add? ~ The Secret of Saying Thanks, by Douglas Wood, insists that giving thanks makes us happy. “We cannot feel thankful and unhappy at the same time.” “We don’t give thanks because we’re happy. 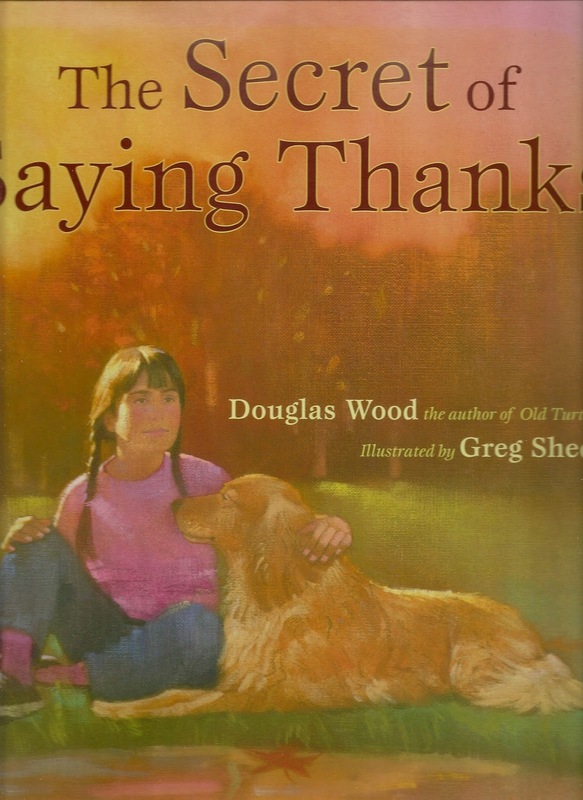 We are happy because we give thanks.” The book can be read in about 8 minutes. With a small group sharing the pictures as you read is the way to go. With a larger group, bring props (a big yellow paper sun, a flower, a tree leaf, a rock, a stuffed animal -a bird if you can find one, a shiny silver star cutout, a bottle of water, and a big red paper heart) to display or hand to people nearby as you read the pages about the things which lead us to be thankful. ~ Thanksgiving begins with noticing what is all around you. It is easy to overlook our blessings. Remind worshipers of Moses noticing the burning bush, stopping to look at it, and meeting God there. Then read and discuss Elizabeth Barrett Browning famous poem. ~ In the congregation’s prayers include prayers for the long holiday weekend. Some children are looking forward to seeing extended family members. Others are dreading a boring, nothing special holiday. Those excited about family gatherings often face undesired seating assignments at “the feast,” uncomfortable sleeping arrangements, and long trips in cramped cars. All are worthy of prayer. ~ One of my favorite times with the children was the year we learned how to say "Thank you" in many languages from our congregation, and ended by using those words for our prayer together: Dear God, thank you for your good gifts. Merci. Danke. Gratias. Molte grazie! In Jesus we pray, amen. 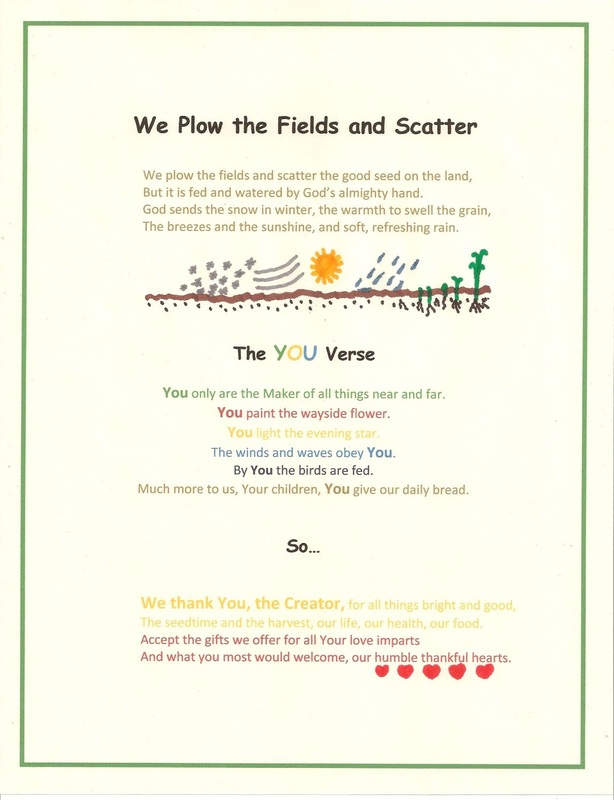 ~ In our (pre-school) Junior Church we open every session by asking what the children are thankful for, and then singing "Thank you Lord for this fine day" (https://www.communityofcelebration.com/zen-cart/media/Thank_you_Lord.mp3), adding lines to the song according to what children have said. We have given thanks for McDonald's, and even for the ceiling of our room. Why not? As you say, "Thanksgiving begins with noticing what is all around you." ~ Above is a YouTube video that expresses it thanks in very intergenerational pictures and simple words. Thank you Hubert Den Draak. Then reread verse 21. From there you can jump to Matthew’s flowers of the field. ~ Repeat the process with animals and Matthew’s birds of the air. ~ Before reading this psalm, list together what makes for a bad year (bad harvests, storms, illness, violent events, feeling stuck in unhappy places, etc.) and what makes a good year (good harvests, great vacations, a good year at school, a new job, etc.) Note that Thanksgiving comes in both the good and bad years. Introduce this psalm as a good one to remember in all the years. Verses 1-3 recall how it felt to be thankful in a really good year (after they had returned from Exile). Verses 4-6 are filled with hope during a bad year that the good years will return. To emphasize giving thanks in both good and bad years, have each half of the psalm read by a different half of the congregation. The reading groups might be the choir and the congregation or two halves of the congregation. ~ Together make a big scribble on a poster. 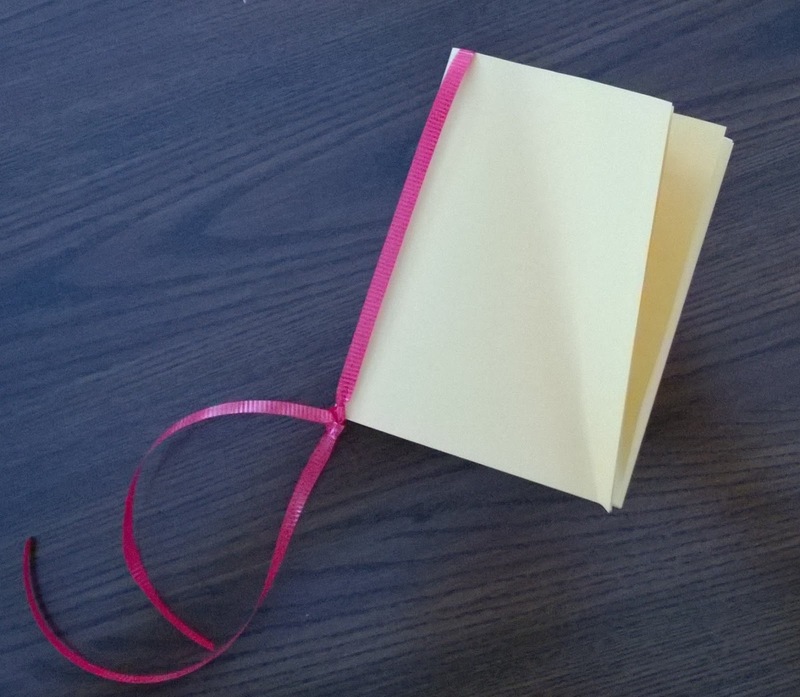 Write the names of a leader or governing body in each section. Then go through the list identifying prayers for each one. ~ In an “eyes-open prayer” display pictures of people, locations, even events from the last year. Offer prayers for each one being specific. This could be a matter of projecting pictures for all to see as a prayer leader prays about them. Or, it could be a prayerful discussion with the children or the whole congregation. ~ Paul begins with a call to prayer for leaders. 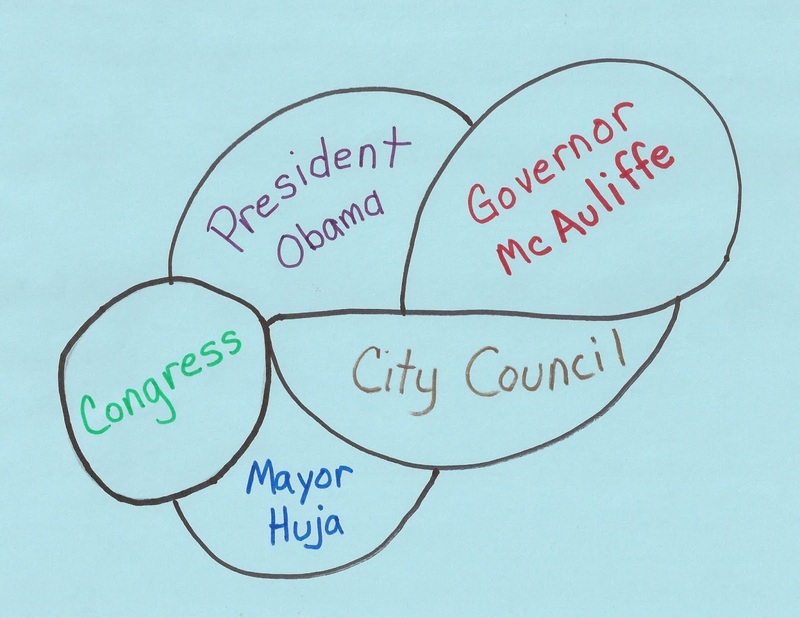 In this election season with all the trash talking about leaders, have a respectful conversation and prayer with children about civic leaders. 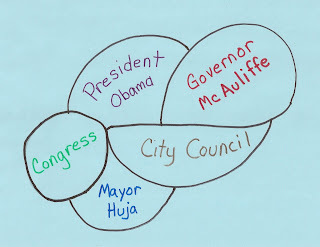 Together name some local, state and national leaders and list some of the jobs they do. You may also want to add people who are running for office. With the children, identify some prayers for our leaders, then offer those prayers. ~ Commentators point out that the leaders Timothy and his friends were to pray for were Romans who were trying to kill as many Christians as possible. In a polarized nation and world this is a call to pray for people with whom we agree and for people with whom we disagree. Create a responsive prayer in which the worship leader describes a person or group on one side of an issue and then the leader or group on the other side. After each petition the congregation adds, “Lord, bless them and keep us living together in peace.” Pray for countries on different sides of international conflicts, political leaders, and local groups. ~ The Christological hymn describing Christ as the mediator is hard for children to understand. First, they need a definition of mediator. Then, they need help to get around the idea that God is big and scary and Jesus is the good guy who helps us deal with God. On Thanksgiving I’d simply read this part without drawing much attention to it. Whatif my head grows smaller? Find the poem on the internet. Read it taking time to enjoy it with facial expressions and pauses. Then invite worshipers to hear what Jesus says about the whatifs in this text. Adults worry about aging. Children worry about growing up. If they play basketball, they want to be tall enough. If they are a dancer or gymnast, they want to be small enough. 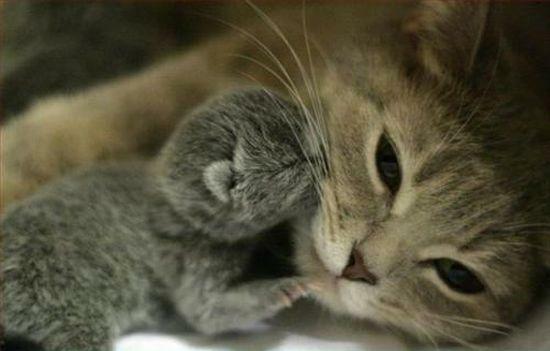 All want to grow up to be good looking. ~ Show pictures of baby animals and adults animals. Marvel at how they change. End with pictures of humans at different ages. Note that God has a different plan for each one – and that God’s plans are good. 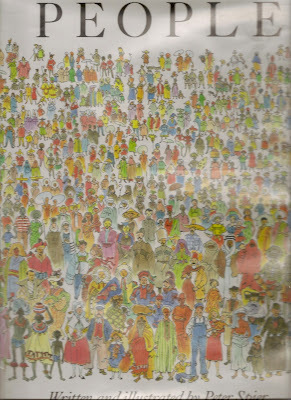 ~ Read and enjoy the opening of Peter Spier’s picture book People. Skip all the information on the opening page. Start with “We come in all sizes and shapes…” and read through “All of us want to look our best. Still what is considered beautiful or handsome in one place is considered ugly, and even ridiculous, elsewhere.” Point to and briefly enjoy all the differences in the pictures. Do be aware that this book was published in 1980 and so includes some cultural distinctions that are no longer accepted. So focus on the pictures rather than the verbal country identifications on the page about clothing. Then reread verse 25 and connect it to all the Spier drawings. ~ Ask children’s classes to prepare banners by pasting birds and/or flowers and/or people all over a large swath of paper or cloth. There may be one banner with all massed together or three separate banners. 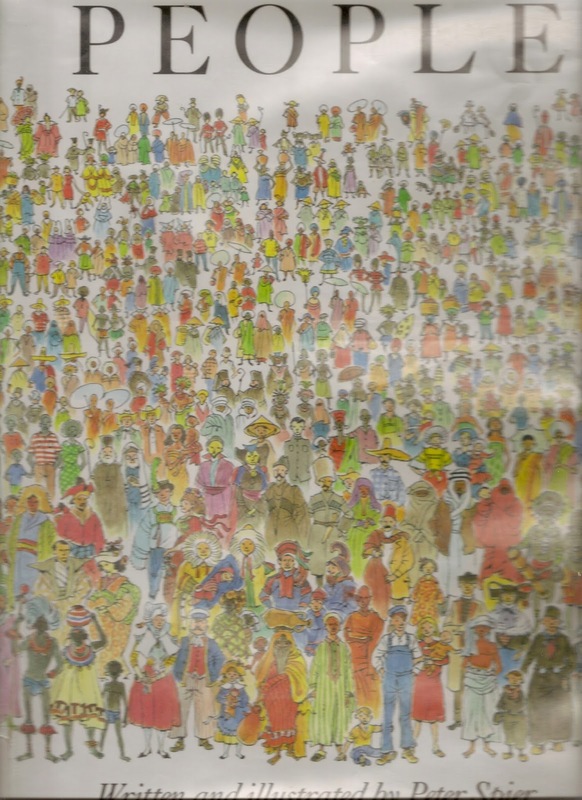 For a community service children from several churches could gather the pictures and turn them over to children/adults of one of the churches to put together. Adults could mount the banners on poles for older children to carry in during an opening processional. Plan for them to be displayed throughout the service. ~ Saying thank you is a way of recognizing the one who gives the gift. On Thanksgiving we name God as the giver of the blessings of the world. I Sing the Mighty Power of God names many of the wonders of the world and names God as the one who gives each one. Point this out before singing the hymn. Encourage children to sing from the illustrated word sheet and to add in the margins words or drawings of other things God creates.